Offspring spend up to six years with their parents, helping to care for subsequent nestlings and learning parenting skills. Most crows do not survive past the first year of life. Those who do survive often live 17 years or more. (The oldest known wild American crow was 29 years old.) [This is the equivalent of human youth staying with their parents through their teens and longer!] The groups of crows in your backyard are extended families, usually numbering six to nine, which gather into larger groups to roost, a practice that protects them from predators. So, it makes sense that crows are so protective, cawwing and swooping when you come near their family members or that they remember when you were standing by a crow that died or if you harm or threaten a crow. It makes sense why a mother crow would seem absolutely crazy flying straight towards you despite your ability to harm her—just to protect her young. 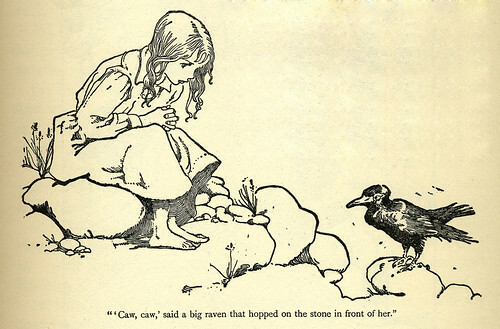 I say to the mother crow, good for you, fearlessly love them while you can! I feel crow-like this week, this month, this year, this life. I feel fiercely protective and unable to resist the urgent rise of worry that forms as inherently in me as breath. And I am swooping, hovering, and crazed in my attempts to keep you safe. I’m tired but never too tired. Never too tired but sometimes alone. Perhaps I’ll tell it to the crow…maybe they can understand. Yes, I am a fully trained-human. The crows have me trained. I started feeding them on a regular basis a few months back. I put bread out on my porch and they take it. I did this daily for a few weeks. Its fun for me, I know, I am a geek. At any rate, I discovered the crows prefer peanuts to bread and so I switched to leaving gobs of peanuts every morning on my porch. There has been a learning curve here but not for the birds, for me. They caw, then wait for their peanuts. This is a daily routine. (Pictures deleted)Lesson 1 in the crows training program was teaching me their preferential diet. I learned they preferred peanuts over bread. They would leave the bread for last and gobble up the peanuts like they were going out of style. Lesson 1 (a): Neighbors do not appreciate when you leave peanuts (or bread) on the shared walkway/porch. They get angry and show this anger in passive-aggressive ways, such as sweeping aggressively outside your door while hitting it repeatedly and forcefully with each stroke. Then later opening the door quickly trying to “catch” you feeding the birds, only to smile and shut their door calmly as if it doesn’t matter, never saying anything to you. I learned it was better to place the peanuts (and/or bread) on the ledge of the porch, rather than the walkway, and sweep up the mess after every feeding. Lesson 2: Scheduled feedings. I have an irregular schedule. The birds…not so much. It just so happened that I would feed the birds in the morning when everyone left. It was a fluke really, not intended to create a pattern. The birds thought otherwise. One day I forgot to put peanuts out and they began cawwing. How cute. =) It reminded me to put the peanuts out, and so I did. A few days go by, I remember to feed them, no problem. Then, I fell asleep on my couch one morning and did not put peanuts out for them, oops. They tried to cawww outside my door but I was too sleepy. I thought to myself, “self, they can wait.” This didn’t go over very well with the crows. They cawwed and cawwed for about a half hour. Then they decided to take it a step further. They went onto the roof and to my chimney and started cawwing down it. It echoed down my unused fireplace and throughout my acoustically-amplified apartment. They were determined to get me to feed them. And I did. And now I am officially trained. They know how to get me to feed them and do so on a regular basis, much to the chagrin of my neighbors. =/ Oops. I think a peanut dispenser is the logical next step for us, the birds and me. Any suggestions on how I can train them?